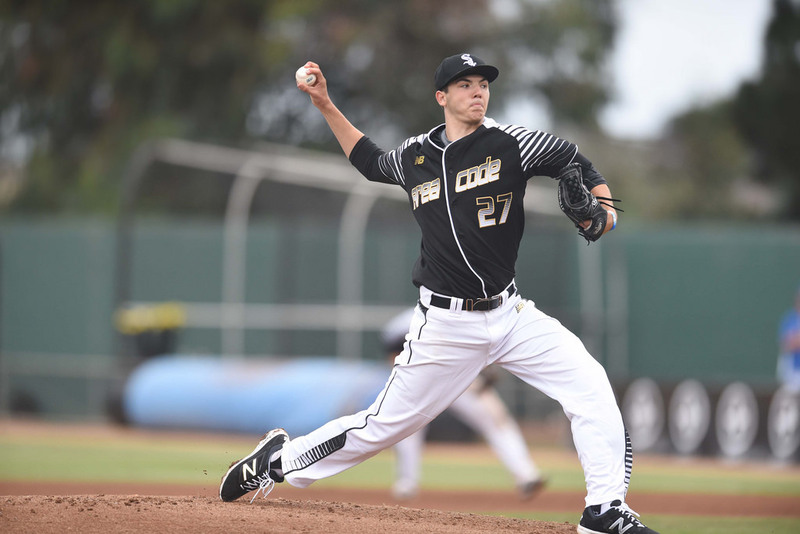 2016 Draft Preview for Local College-age eligible players of note. We’ll review the 16 regionals in order of the larger bracket. Bold is the host and Bolded Red is the winner. We’ll also highlight significant players and/or guys who are big names in the upcoming draft as we get to them (MLBpipeline.com summarizes their top 200 ranked players here: i’ll just talk about the 1st round talents and players w/ local ties). 1. In the Florida regional, UConn put a mini upset loss on Georgia Tech, who tried to sneak a win with a mid-week starter and now face a loser’s bracket hole. Meanwhile Florida surprisingly stuck with their rotation and threw ace/friday starter Logan Shore in game one against Bethune-Cookman. Presumed #1 pick A.J. Puk then went up against UConnn and their 1st round Ace Anthony Kay. In the winner’s bracket game and both laid eggs; Puk couldn’t get out of the 5th and Kay gave up 5 runs in 5+ innings. One wonders if this causes some last minute changes at the top of draft boards. Nonetheless, Florida got a run in the 8th to take it 6-5 and assume control of the regional. Georgia Tech took out UConn to face Florida in the regional final, where they got pummelled 10-1 as Florida advanced. 16. In the Florida State regional, Florida State and Southern Miss destroyed their foes in the first games, and Florida State made quick work over Southern Miss to advance to the championship game. South Alabama lost 14-2 in their opening game; they were one of the last at-large teams to make the tourney at the expense of UNC and UNC’s Zac Gallen took to twitter to let the selection committee (which included South Alabama’s athletic director) know it. Can’t blame him; the ACC has dominated in this tourney so far. That being said, South Alabama did advance out of the loser’s bracket to face Fla State in the regional final, where they got obliterated. Florida State Advances, scoring 43 runs in three games. 2. In the Louisville regional, both Louisville and 2-seed Ohio State handled their openers. Louisville threw Kyle Funkhouser and he gave up just 4 hits in 8 innings, with presumptive upper 1st rounder Corey Ray going 3-5 at leadoff. Louisville pounded Ohio State in the winner’s bracket game, putting themselves in the easy driver’s seat and making them an early CWS favorite. Louisville ended up downing Wright State to advance. 15. In the Vanderbilt regional, awful news broke just prior to the game when it was learned that one of Vanderbilt’s freshmen pitchers Donny Everett drowned the previous weekend, casting a pall over the regional. UC Santa Barbara held serve in their first game. When Vanderbilt finally took the field, they completely melted down in the 7th inning, giving up 13 runs in the frame (half of them against likely 1st rounder Jordan Sheffield) to lose 15-1 to 4th seeded Xavier. In the loser’s bracket, Vanderbilt’s coach left in his starter Kyle Wright far too long (122 pitches but more importantly turning an 8-2 lead in to an 8-7 nailbiter), and Washington eventually hit a 2-run homer against the bullpen for the win. 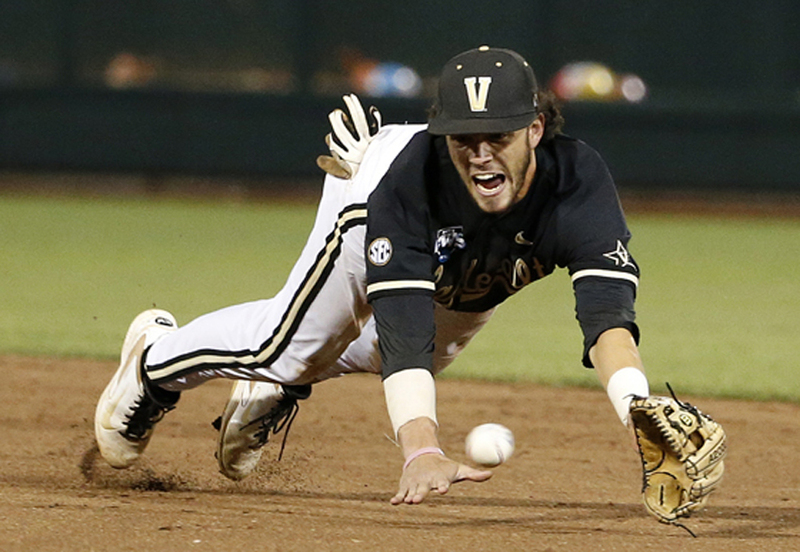 Vanderbilt goes 2-and-out as a host and ends their streak of making the CWS finals. Meanwhile UC Santa Barbara took control of the region and forced Xavier to have to beat them twice to advance; it didn’t happen as UC Santa Barbara pounded Xavier 14-5 to advance to their 1st super regional ever. 3. In the Coral Gables regional (host #3 Miami), Long Beach State got an early upset win over Florida Atlantic while Miami eased past in-state rival Stetson. Miami won a squeaker over Long Beach to take control of the regional, but it was closer than you’d expect. Stetson went 2-and-out quickly. LBSU got back to the winner’s final, and almost had a 9-run comeback against Miami before dropping the regional final 9-8 on a Miami walk-off. 14. In the Ole Miss regional, Mississippi became one of the only hosts to lose its first game, dropping a 6-5 decision to the probably-underseeded Utah team. Boston College also got a mini-upset when their 1st round prospect ace Justin Dunn dominated Tulane to setup a 3-4 seed winner’s bracket game. Ole Miss then promptly went two and out by losing the next game to Tulane. Boston College beat Utah to take control of the regional. Tulane overtook Utah to make it to the regional final, but Boston College handled them easily to advance as a #3 seed. 4. in the Texas A&M regional, both seeds advanced (TAMU and Wake Forest) initially without much fanfare, but then TAMU embarassed Wake Forest to the tune of a 22-2 beatdown in the winner’s bracket. TAMU may “only” be the 4th seed, but they’re #1 in some polls and are looking very dangerous. TAMU eventually advanced against Minnesota, who made it to the regional final as what many thought was an undeserved #2 seed. 13. In the TCU regional, Gonzaga upset Arizona State and pressed TCU in the winner’s bracket game before falling 4-3. Arizona acquitted themselves and got back to the regional final, where TCU made short work of them 8-1 to advance. 5. In the Texas Tech region, the hosts destroyed Fairfield in the opener and then New Mexico shocked Dallas Baptist. DBU advanced to the loser’s bracket final. Texas Tech won a nail-biter over the tough New Mexico team in the winner’s bracket game. DBU advanced to the regional final, where they took one game off of Texas Tech to force the winner-take-all game. In a back-and-forth game, Texas Tech jumped ahead in the 6th and made the lead stick to advance. 12. 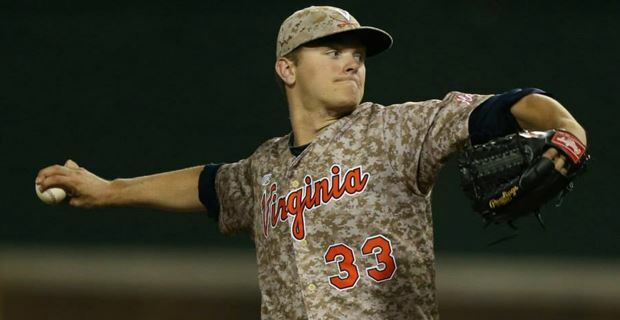 In the Charlottesville Region (host #12 UVA), UVA took a gamble and threw struggling sunday starter Alec Bettinger against in-state rival William & Mary (filled with Northern Virginia alum) and pounded their starter Dan Powers (of my alma mater Madison HS in Vienna). UVA didn’t stop there, eventually winning 17-4. Meanwhile, ECU (half of their lineup is VA-based) destroyed Bryant’s bullpen en route to a 9-1 easy victory in a “minor upset.” ECU has to like their chances, having taken 2 of 3 in Charlottesville earlier in the season. UVA did their best to keep this from happening, taking a 6-3 lead into the 9th against some-time starter (and Vienna native Tommy Doyle, who promptly gave up 5 runs in the 9th and a walk-off 3-run homer to blow the game for the Cavaliers. W&M made quick work of the over-seeded Bryant team and gets a second crack at UVA, who now faces a big up-hill battle to advance. Interesting choice to finish the game; doesn’t UVA have, you know, relievers and a closer for that task? Then, to add insult to injury in the Loser’s bracket elimination game William & Mary quickly got to UVA’s saturday starter Daniel Lynch and then tacked on two more on Doyle to eliminate last year’s champion UVA 5-4. UVA just didn’t have the pitching they needed and sorely miss the presence they got from someone like Josh Sborz last year. W&M and ECU face off having eliminated the top two seeds in this regional, and ECU easily advanced to the Super Regional. ECU was the first team to book its ticket to the super-regionals this year. 6. In the Mississippi State regional, the hosts won their first game and then eased by the dangerous Cal-State Fullerton team to take control of the regional. CSF got upset by Louisiana Tech in the losers’s bracket, but it didn’t matter as Mississippi State wasn’t troubled in the regional final to advance. 11. In the Louisiana-Lafayette regional, both top seeds held serve in the first games before weather pushed the whole regional by a day. ULL made it to the regional final with a 10-3 victory over Arizona, but Arizona came back through the loser’s bracket and took two straight over ULL to win the regional in a winner-take-all game Monday. 7. In the Clemson regional (host #7 Clemson), Clemson scored an astounding 24 runs to win a slugfest in its opener but then had its hat handed to them 12-2 by Oklahoma State in the winner’s bracket game. Huge showing by the Big-12 so far in this tournament. Clemson battered their way back to a rematch … where Oklahoma State promptly beat them again 9-2 to advance. Clemson becomes the first national seed to fall, albeit not in a hugely surprising fashion to a very good OK State team. Clemson’s Seth Beer continued his monster season, finishing up one of the 5-best freshman seasons we’ve seen in a while and putting his name on the map for the 2017 draft (where he’ll be a draft-eligible sophomore). 10. In the South Carolina regional, the hosts were shocked by Rhode Island in the opener while UNC-Wilmington (who starts four guys in the lineup hailing from Virginia) destroyed Duke to put themselves in the driver’s seat. UNC-W continued on, beating Rhode Island 11-7 to head to the winner’s bracket final. South Carolina downed Duke in the elimination game to face up with R.I. again. There, South Carolina got their revenge, beating Rhode Island by the astounding score of 23-2. In the regional final, SC had to beat UNC-W twice to advance; they forced the winner-take-all game with a 10-1 dismantling of their CAA foes sunday night. The winner-take-all game got rained out monday, pushed to Tuesday. In that tuesday game, South Carolina jumped ahead early and held on to win the last game 10-5 to complete the comeback out of the Loser’s bracket and advance. 8. 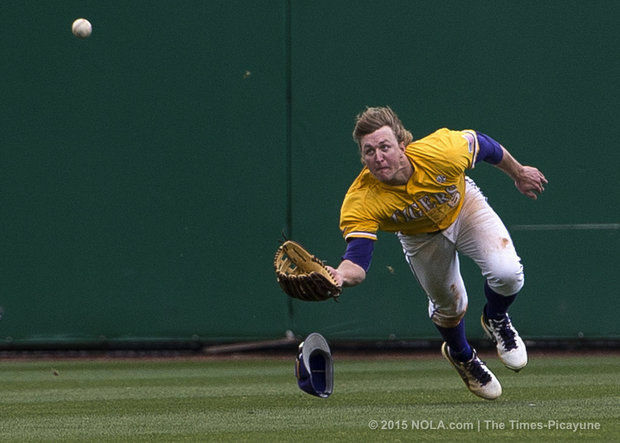 The LSU regional was plagued by rain. They only got one game in on Friday and Saturday. however, LSU saved their ace Alex Lange for the Rice matchup, where he’ll face another highly regarded college junior in Jon Duplantier. A freak “ground rule grand slam” set the tone early and LSU prevailed. Rice came back through the loser’s bracket and took the first game from LSU in the regional final, forcing a winner-take-all Tuesday. In that winner-take-all game, Rice jumped out ahead but LSU had a clutch go-ahead homer in the 7th to break Rice’s back. LSU advances and becomes the last of the 16 teams to do so. 9. In the NC State region, NC State pounded Navy’s Luke Gillingham to put away any chances of an upset while Coastal Carolina eased past St. Marys to setup a fun all-Carolina matchup in the winner’s bracket. Navy put St. Marys on 2-and-out. The NC State-Coastal game was delayed a day by weather, but Coastal held a 3-0 lead going into the bottom of the 9th to delay the inevitable. NC State destroyed Navy in the loser’s bracket final 17-1 to face off against Coastal twice to advance. In the first game of the final, NC State easily beat CC to force the winner-take-all game. That game, believe it or not, was suspended in the top of the 9th with NC State holding a 2-run advantage and had to be pushed to Tuesday. When they resumed the game … Coastal Carolina rallied for four runs in the top of the 9th to win the game and the regional. Amazing. 10 of 16 hosts advanced, including 7 of 8 National seeds. This is a far cry from 2014, which lost most of its national seeds early, but about in line with 2015’s tournament where 11 of 16 advanced. 5 = number of regionals forced into the “extra” deciding game, most of them on Tuesday thanks to weather. 10 number one seeds, 4 number two seeds, and 2 number three seeds advance to the super regionals. 6 number of #4 seeds who didn’t finish 4th in their regional: two were runner’s up in their region (William & Mary and Xavier). 2 hosts that went 2-and-out (the understandable Vanderbilt and Ole Miss). 5 of the regionals went pure chalk, a decent indication of the job the seeding committee did this year. Biggest upsets: Xavier destroying Vanderbilt, Utah beating Ole Miss. I think the top 4 seeds are class this year; i’m going with Florida, Louisville, Miami and TAMU to start, and two of them are helped by going against first time super-regional teams. We have two Super-Regional rematches from last year (Florida-Florida State and TAMU-TCU), which followed last year’s multiple super regional rematches. I know the committee likes this, but I don’t; give these teams a shot at playing someone else. Florida destroyed Florida State last year and their pitching staff should control them again this year. I don’t see Louisville troubled. Miami-BC is an ACC match-up that never happened this season. I love TAMU-TCU and think its unfortunate they meet here and not Omaha; they played a fantastic regional last year that culminated in a 16-inning decider. Ncaa.com’s interactive full 64-team bracket with up-to-the-minute box scores of live games. On 5/29/16, a day before the entire field was announced, the 16 Regional hosts were announced. These are also the top 16 seeds (though they only acknowledge the top 8 “national seeds”). The following day, the entire field was announced. Here’s a look at the 16 regional tournaments with some quickie thoughts. 1. Florida, Georgia Tech, UConn, Bethune-Cookman: hard to see the #1 overall seed and presumptive favorite all year lose at this stage. 16. Florida State, Southern Miss, South Alabama, Alabama State: Some think there’s an upset possible here, since both Southern Miss and South Alabama are tough; I still think Fla State can power its way through here. If seeds hold, Florida meets Florida State for a fun intra-state tourney. They’ve played three mid-week games this season with Florida sweeping them all, so odds are that Florida is making Omaha. 2. Louisville, Ohio State, Wright State, Western Michigan: Ohio State as your 2-seed isn’t scaring anyone. 15. Vanderbilt, UC Santa Barbara, Washington, Xavier: Not really much of a challenge for Vanderbilt in this regional; not even another top-25 team. If seeds hold, yet another intra-state repeat super-regional matchup between these two teams, and a pretty tough draw for Louisville if it happens. Vanderbilt is better than a #15 seed and this match-up seems like its forced to save a few dollars in travel costs; both of these teams are legitimate Omaha threats, with Vanderbilt having made the final in both of the last two seasons. 3. Miami, Florida Atlantic, Long Beach State, Stetson: Miami and Florida Atlantic split a couple of mid-week games; they have a dangerous Long Beach State as a #3 seed. tough regional. 14. Ole Miss, Tulane, Boston College, Utah: Ole Miss will have its hands full with Tulane but should advance. If seeds hold, Ole Miss gets a tough assignment going to Miami, but Miami should prevail. 4. Texas A&M, Minnesota, Wake Forest, Binghamton: wow, Minnesota as your #2 seed? Tough regional you laid out there for TAMU this year. 13. TCU, Arizona State, Gonzaga, Orel Roberts: I don’t trust any of the Pac-12 teams this year; TCU should prevail. If seeds hold, yet another manufactured super regional of local teams. They didn’t play mid-week this season. This could be a good series; some think TAMU is the beat team in the land. 5. Texas Tech, Dallas Baptist, New Mexico, Fairfield: shouldn’t be too tough for newcomer Texas Tech. 12. UVA, Bryant, ECU, William & Mary: well, UVA got kind of short changed here; Bryant isn’t tough but ECU can be. They can’t be happy about seeing in-state rival W&M either. They dodged a bullet with a weaker #2 seed though. If seeds hold, Texas Tech-UVA is super close; they’re #6 and #7 in d1baseball’s latest poll. I know nothing of Texas Tech but know UVA has played great as of late, has two 1st round talents and could be a tough out. 6. Mississippi State, Cal-State Fullerton, Louisiana Tech, Southeast Missouri State; Mississippi State should cruise here: Fullerton looks tough on paper but can come up short in the playoffs. 11. Louisiana-Lafayette, Arizona, Sam Houston State, Princeton: some upset potential here if you trust any Pac-12 teams. If seeds hold, hard to see Mississippi State (ranked #3 in d1baseball’s latest poll) losing. 7. Clemson, Oklahoma State, Nebraska, Western Carolina: Clemson will be favored but will struggle with OK State. 10. South Carolina, UNC-Wilmington, Duke, Rhode Island; tough regional for South Carolina; Duke is no slouch and Wilmington is tough. If seeds hold (and sensing a pattern here), another intra-state superregional. Clemson-South Carolina would be fun. 8. LSU, Rice, Southeastern LA, Utah Valley: hard to see LSU getting stressed here: Rice always underperforms in the post-season. 9. NC State, Coastal Carolina, St. Marys, Navy: tough blow for Coastal, which apparently went from just missing being a regional host to having to travel to tough ACC competitor NC State. Meanwhile, NC State probably has the hardest regional of them all, with Navy’s pre-season all-american Luke Gillingham set to go in game 1. If seeds hold, LSU-NC State could be a barn burner. Easiest Regionals: I’d go with TAMU, Florida, Louisville. Hardest Regionals: NC State, South Carolina, UVA. My Omaha predictions right now: Florida, Louisville, Miami, TAMU, UVA, Mississippi State, South Carolina, LSU. A lot of chalk there. The college podcasts listed a few other snubs like Kent State and PAC-12 teams Oregon and/or Oregon State, but for me it starts and ends with UNC. #1 Florida has likely #1 overall pick A.J. 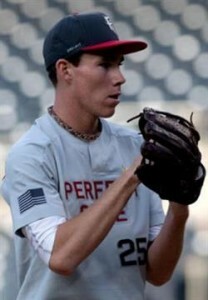 Puk, but their “other” Ace starter Logan Shore is also a likely 1st or 2nd round pick. Also a likely high pick is OF Buddy Reed. #2 seed Louisville is led by likely top-5 pick Corey Ray and has two big arms you’ll hear mentioned on draft day (Zach Burdi and Kyle Funkhouser). Miami’s Zach Collins is probably the first catcher off the board. UVA is led by Conner Jones and Matt Thaiss, both likely 1st rounders. Mississippi State’s ace is Dakota Hudson, likely the 2nd or 3rd college arm drafted. Vanderbilt is led by 1st rounder Jordan Sheffield and in the field by likely 2nd rounder Bryan Reynolds. Boston College’s staff is led by likely 1st rounder Justin Dunn. Wake Forest’s Will Craig is one of the top sluggers in the nation, on the leader boards for both average and home runs. UConn’s Anthony Kay will make life difficult for Florida if he is saved for the winner’s bracket game. After Texas failed to make the tourney, their long-time coach and noted arm-shredder Augie Garrido stepped down to take an administrative job.